A few years ago we prepared a submission and I presented it to Parks Victoria detailing the case for the No Boating Zones and shared windsport zones to be adjusted to better suit the needs of windsurfers. There was a particular emphasis on our popular windsurfing spots which were significantly restricted by the no boating zones and which with small modifications could easily be adjusted to accommodate windsurfing. Anyway, today I finally had an update from Parks Victoria to say that our submission has been presented to Marine Safety Victoria with the recommendation that our 1st option proposals for Elwood, Dendy St and Hampton be put to the public for consultation with the view of making the changes as long as there are no significant objections. Marine Safety VIC will respond in the next 10 days and if they agree then a 4 week public consultation window will be provided. Please prepare yourself to have your say during that period. We need to make sure that everyone stands up to be counted - this is the chance to have the adjustments made to once again allow windsurfing at these great spots. I'll let you know when Parks Vic get their response from Marine Safety Vic. Can you please keep us posted about where to have our say Fletch? I just googled and found this - looks like the consultation has begun. The new proposal for bonbeach is screwing us! They want to move the pole even more north to the end of the car park (ie where we launch from). This is not good at all for us Every bonbeach sailor needs to put in some feedback to object to this new proposal! Steve: Is this something you can look into as well ? I think I'm pretty happy with the change at Elwood. The pole would move 50 meters north which should mean that it ends up back where it originally was. Brighton looks good. Moving the pole further north will likely reduce the odds of crossing into the no boating zone on a SW. Lot of folk don't seem to care about avoiding it, but it should reduce conflict with the lifesavers in Summer. If you approve (or disapprove) of a particular scenario make sure you respond to the survey monkey survey or email. To help out I have posted my email here. How long has the windsurf community gathered at Bonbeach, I'm not sure of the history, if anyone does please let Parks know its historically significant as well. Dear Sir/Madam, I write to provide direct feedback on the proposed changes to Bonbeach beach to extend the 'Vessels Prohibited' boundary 60 m North of the car park. I am a local resident and spend all year at the beach with my family walking, swimming, paddle boarding and windsurfing. As a local member of the community I have been actively involved in community groups including the Chelsea and Bonbeach Train Station group for 5 years and part of the windsurfing community that frequently gathers at Bonbeach. I directly oppose the extension of the 'Vessels Prohibited' boundary as a swimmer and a paddle boarder but primarily as a windsurfer for the following reasons. The Northern end of the Bonbeach cark park is one of a unique few windsurfing launch spots that allow rigging from the carpark with direct entry to the water. This current configuration in fact has created part of Bonbeach's identity, a small beautiful beach that attracts sailor from far and wide (from Inverloch to those on the western side of Port Phillip Bay), these sailors are the ones that inspire and help the young windsurfing community grow. Affectionately known as 'Bono' windsurfing is one of the few things that makes Bonbeach unique. 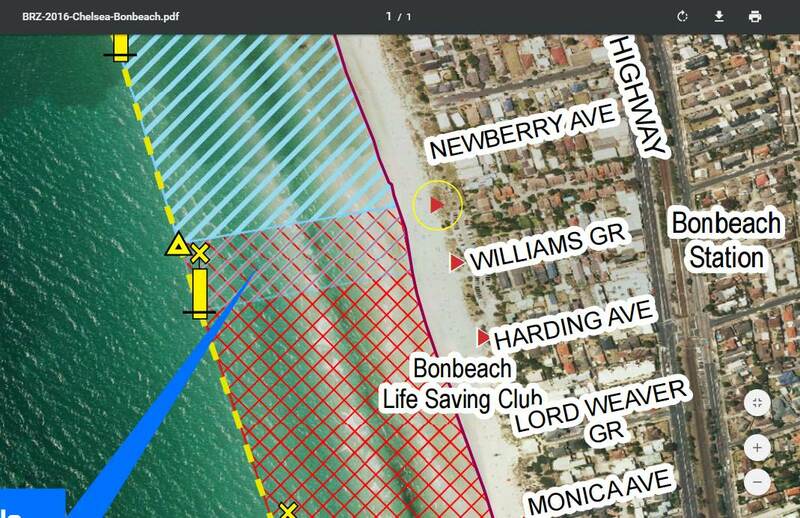 An increase in this no vessels zone would leave the windsurf community with no option but to walk up to 60 meters with their gear, often multiple sails and configurations or to begin to attempt parking in residential spaces where beach access was direct. I also strongly believe maintaining the windsurf culture in Bonbeach is important and a key contribution to the sport and all the benefits that come with a sporting community. As you have recognized the SUP community is growing at a rapid rate to the point of proposing shared paddle and swimming zones. These new SUPs that are becoming more accessible are also designed consistently with the feature of adding a sail to them. Windsurfing therefore is a sport that is becoming more and more accessible as specialized equipment is replaced by the ability to sail your SUP. By increasing the Vessels Prohibited zone you are in fact stunting the opportunity for this next generation of beach goers with SUPs from exploring the fantastic sport of windsurfing. With the new restrictions they will not be able to try out the sport in light winds from the carpark as they too will have to transport their sail and equipment 60 m up the beach. I understand and acknowledge the need to increase swimming zones as the population increases and therefore propose that an extension to the Vessels Prohibited zone could be achieved south of the current zone. Yes beach goers and swimmers would need to travel from the car park further but they have more mobility, I also think it is a better idea as more foot traffic would pass in front of the life saving club a) increasing its visibility and b) increasing the chance of beachgoers swimming between the flags. A far better outcome in the minds of safety. From personal experience I know this safety is important. Last summer I witnessed 3 children getting into trouble at the north edge of the current swimming zone, I was packing up my equipment and ran to the lifesaving club who did not spot the issue until I pointed it out to them (was well outside of the flags). What was clear was that the club had a difficult task in spotting them from the glare of the sun to the north, I was able to see them because I was in direct line with them when I first saw them. If they were to the south of the club with the sun to the north the club would have spotted them more easily. In the end the children were able to swim in after the body board was blown away. I appreciate this is a very unique scenario and although changes to zones may not have prevented this situation I thought it was worth highlighting from the swimmers perspective. Great response Ginno....and it is true, the survey is horrible! I tried to complete it twice already but it got stuck on one of the questions, clicking next just loops back to the current question and does not continue, thereby making it impossible to complete and submit! I agree with you and also think that we should be emphasizing the safety concerns of extending the zone further north, ie further away from the life saving club, when it should be extended further south and nearer to the slsc. It is quite obvious from reading the survey questions that the council's priority is "safety", every question is geared around it. So you make some very compelling reasons not to move it further north. Thanks for your support!!! they need to change the no vessels swimming only area in hampton….this is where i learnt to windsurf….its the best spot to learn to sail with a s, se or ssw wind…it is currently classed as a 5knt zone…that area in-between the groin there where all the kiters hit up is just kaos its like the punt road of the bay and to limit that area to a multi water sports area is ridiculous when you are governed where you can sail or kite by the direction of the wind. Just sent an email to the Kingston South Ward councilor to ask for support and called Parks Victoria. Parks were not able to confirm the receipt of my email so I am awaiting a call back. Once I have confirmation I will draft a generic response that everyone can use to forward on via their email as the online survey is useless. Great! Myself and all the other Bonno crew have or are writing them emails as well. Hopefully common sense prevails. Time is running out. Have your say about your local spot - or support the reasoned arguments being put forward by windsurfing colleagues at their favourite spots. Consider an email as some people are finding the survey problematic (or do both). Gents, I am unclear if you are trying to change the zoning specifically for windsurfing only, from my involvement in the original zoning some years back Parks Vic won't create seperate zones for different sports, eg different for windsurfing to kiting. That said I am not sure why you seem to want to go it alone when the combined power of all water users may present a better chance to drive change. edit: After looking at some of the proposed changes that have potential impact on ALL. Shared water sport areas I have started a new post in the Kitesurfing Vic forums drawing their attention to the changes and survey. I did both, email and survey (had no problems there). Please allow coexistence of swimmers and other recreational water users using common sense. Perhaps it can be generally considered to have seasonal rulings like dog off leach areas for wind sportspeople to go about their activities in winter or shoulder seasons when there are no swimmers around. Just found this, am I too late to send my views? The zone in Parkdale is just stupid. You have until 16th Dec to provide your feedback. But to my knowledge Parkdale was not subject to change or up for public feedback. I know the shared zone is not really usable as there's no rigging area anywhere. But heading off from the Yacht Club has always been ok IMO. added my thoughts to survey. Who ever designed it wants to make it hard to respond with the questions proposed. Quite hard to understand TBH, oh well ....government! Will keep doing it. Just irks me that they set a watersports area whree there is no place to rig, the beach is much better for swimmers. And there's a yacht club 200m away......Just reeks of someone making a mistake marking a map and then it just gets left there. Agree, typical Public Servants, what can you expect. They have no idea! A quick skim through it looks like some common sense has prevailed, I haven't gone looked at the map updates in any detail though. I'm pretty sure those maps aren't updated but are simply what was originally proposed and what was asked for comment on. Outcomes have just been emailed, no change at Williams Grove Bonbeach! Yes I saw that, its a win for the bonno locals!